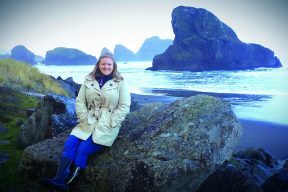 USA grad, Dr. Theresa (Hornick) Larson, DPT and current USA student, Dianna DiToro, SPT first met at a student veterans meeting while both were attending the University of St. Augustine’s California campus. 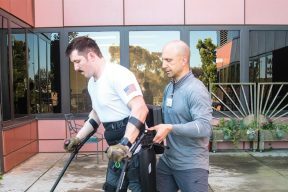 The two quickly bonded over similar experiences as Marine officers and discovered that they both had a passion for functional fitness and its therapeutic application. While both were still students at USA, Theresa organized a charity event to benefit the Semper Fi Health and Wellness Foundation in honor of Dianna’s late husband, Tom, who passed away in a military helicopter mid-air collision during Dianna’s first term at USA. The event was based on a form of high intensity functional fitness and featured Olympic lifts, mobility concepts and tools, and an atmosphere of competitive support hosted by Source CrossFit in Oceanside, CA. After such a successful and well-received event, Theresa and Dianna decided that they could help more people if they decided to do additional events focusing on teaching athletes about mobility. After Theresa graduated from USA in 2012, she spent several months working at Rehab United, before embarking on creating her own business, Movement Rx. 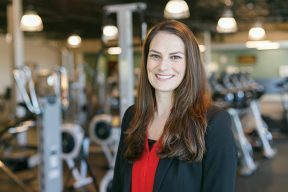 She quickly set about developing the curriculum for a group introductory class about the importance of joint stabilization and mobilization, and how it impacts athletic performance, longevity, and safety, and delivered it to several CrossFit gyms and sports performance centers in the southern California area. When her school schedule allowed, Dianna accompanied Theresa to these seminars and assisted Theresa in teaching and presenting. Dianna and Theresa greatly benefitted from the mentorship and friendship of Dr. Kelly Starrett, DPT and incorporated many of his teaching paradigms in their own mobility seminars. Theresa also utilized the information she learned from her manual therapy courses at USA as well as the continuing education she has performed under the Gary Grey Applied Functional Science model and Gray Cook’s Functional Movement Screen method. 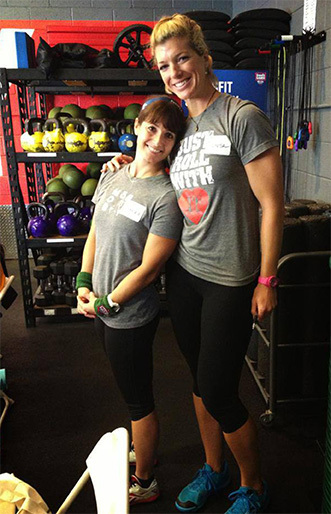 As veterans and as functional fitness enthusiasts, Dianna and Theresa were introduced to the charity organization known as Team Red, White and Blue, which focuses on integrating the veteran into his/ her community through physical fitness and community events. Their involvement with Team Red, White and Blue yielded an invitation to coach/teach as the first annual Veterans Functional Fitness Camp in Washington, DC in June 2013. Here, Dianna and Theresa were able to talk to veterans of all physical abilities, to include several wounded warriors, and share the importance of and how to obtain improved function through fitness, positioning, and self-mobilizations. Theresa and Dianna enjoy being able to give back to the veteran community and partnered up with Sarah Plummer, as well as Kate Hendricks, to offer a day-long retreat for veterans and civilians alike to improve mental and physical resiliency in July 2013 during Dianna’s break during terms. Theresa continues to cater to functional fitness athletes and particularly, the adaptive athlete, by coaching a Wounded Warrior class at CrossFit DelMar and maintains a business as a human performance coach and physical therapist specializing in functional fitness and movement. Dianna enjoys joining Theresa on mobility seminars when her academic schedule allows and plans to graduate in August of 2014. Theresa and Dianna have also individually published articles in the popular and informative Tabata Times online publication. (www.tabatatimes.com) Both are grateful for USA for the introduction to each other and for the strong academic and clinical education which serves as their foundation for serving their communities. Theresa Larson, DPT is the owner of Movement Rx and can be found at www.drtheresalarson.com Theresa is a CrossFit Level 1 trainer, CrossFit Mobility Trainer, CrossFit Olympic Lifting Trainer, and author along with Dianna of the up and coming anthology: Phoenix: “Women Warriors on Recovery, Resiliency, and Triumph” (www.phoenixwomenwarriors.com). Dianna DiToro, BS, MS, MA, SPT, CSCS is a CrossFit Level 1 trainer, CrossFit Mobility trainer, CrossFit Endurance trainer, CrossFit Olympic Lifting trainer, United States of America Weightlifting (USAW) Level 1 Sports Performance Coach, and a National Strength and Conditioning Association (NSCA) Certified Strength and Conditioning Specialist (CSCS).